In my vineyard I use two types of training/pruning methods: Double Guyot, which is cane pruning using a low wire and vertical shoot positioning and Low wire cordon training with spurs. This video covers the latter. I will be posting another video in a few days that covers the Double Guyot method which is the system I use on most of my vines. In the mean time I hope you enjoy this one. Pruning is something I look forward to every year. After a long winter it is the first time you get into the vineyard, the first sign of spring, and the beginning of a new, hopefully delicious, vintage! I look forward to your comments and/or discussion. That was a pretty good vid. You could teach a few professionals a thing or two. Hi David, I just found your blog. My husband and I moved recently, and discovered we have a huge, beautiful grape vine growing on our property. We would really like to cultivate it, support it, and ideally, plant more vines. Would you be open to a little email advice on the best way to support the vine that we currently have? I can be reached at gal.from.cali@gmail.com. I'd really appreciate it! Thanks for stopping by. I'd be more than happy to help any way I can to get your vine producing, plant some more, and of course, make wine! I'll drop you an email. Hello David - Good stuff! I've enjoyed going through your blog and the recent video was nicely done. By way of a brief intro, I've been (part-timing, out of love) vineyard manager at Morgan Creek Winery & Vineyard here in southwestern Minnesota for about three years now. With no real background and zero formal training, I've been absorbing as much vineyard management info as I can find. It's nice to run across your sort of post! "Blogging" is also sort of new to me, but I just wanted to, again, say good job. 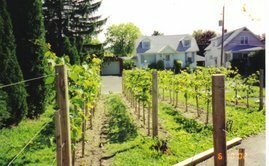 My Husband and I have started a backyard vineyard on our ten acres in KY.
We were encouraged to do so by a local winery, but now growers around here are having a hard time selling their grapes. I would really like to learn how to make good wine so that i can just make my own and not depend on these winemakers to make it for me. Are you making wine and if so where should I start to learn what i need to know to make good quality wine? Thanks for stopping by. Sounds like you have a fairly large vineyard. I do make my own wine as a mtter of fact I've been making wine longer than I've been growing grapes, for almost twenty years now. 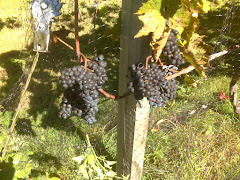 You can certainly make qquality wine, can I ask what varieties you are growing?